Most commercial hand soaps contain antibacterial ingredients. One of these antibacterial agents is triclosan. There was a study that showed triclosan can alter hormone regulation. A number of other studies have demonstrated that bacteria exposed to triclosan could potentially become resistant to antibiotics. Avoiding triclosan and similar antibacterial agents is a good idea. So Katie of Wellness Mama created this homemade foaming hand soap for health reasons. 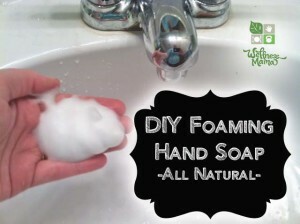 It is a surpirisngly easy recipe, and eliminates the need to buy commercial hand soaps.